Oksun Lee and Oksun Park, the surviving “comfort women” from South Korea participated in 4 km walkathon with House of Sharing employees and 40 volunteers at World Cup Park in Seoul, on May 13. Oksun Lee, one of the ‘Comfort Women’ survivors, attended her first walkathon on the 13th at the 2017 17th Women's Marathon at the World Cup Park in Seoul. She was wearing a yellow scarf with a beige jacket and pink flower hat. She replied with a calm smile to those who said hello to her. A fellow “Comfort women” survivor OkSun Park was there with her. They both lived in China for many years and came back to South Korea and found a new home at the House of Sharing, a shelter for victims of Japanese military sexual slavery in WWII. 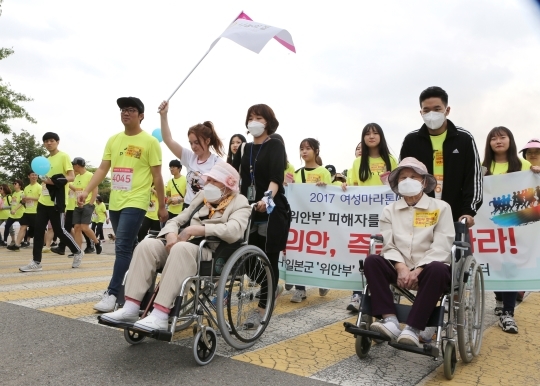 They were both in wheelchairs at the 4km walkathon and they were urging both governments to invalid ‘2015 Japan-South Korea Comfort Women Agreement’. Lee said she cannot accept the agreement that Japanese and South Korean government made without considering the survivors’ side. Of all, Japanese government must admit legal responsibility and apologize to the survivors, she insisted. 40 volunteers including 8 people from Japan, Canada, the US, Ireland and the House of Sharing employees have joined the survivors. At the start line, they chanted “The Japanese government should apologize and pay formal reparations to the survivors” and “Let's Stay strong”. Meanwhile, the House of Sharing set up their booth at the marathon and informed marathon attendees about Japanese military sexual slavery and women’s rights issues. They called for cancellation of ‘2015 Japan-South Korea Comfort Women Agreement’. The Women’s Marathon was co-hosted by The Women News and the City of Seoul and about 8000 people attended the event.